Since Dougherty, Ryan, Giuffra, Zambito & Hession was founded in New York City, New York, in 1944, we have helped people navigate many difficult situations, such as personal injuries and even death. Additionally, our law firm handles all other aspects of civil law, including maritime law, appeals, insurance, real estate and wills. Starting with a free initial consultation, we work closely and personally with all clients to listen to their concerns and develop a strategy to meet their goals. Building a solid case requires an attorney to be proactive and innovative. Our law firm offers clients a forward-thinking team that is highly proficient in litigation, as well as in appearing before administrative tribunals and arbitration panels. We use every tool at our disposal. Thanks to our memberships with organizations such as: the Maritime Law Association; American Bar Association; the New York State Bar Association; and the New York City Bar Association; we have a wealth of resources and an extensive network of professionals to incorporate into our work. Are listed as "Super Lawyers;"
We have the ability to combine our attorneys' individual talents into a team approach that provides clients with exceptional representation. 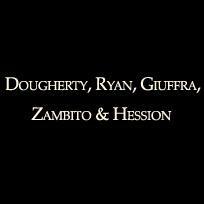 The law firm of Dougherty, Ryan, Giuffra, Zambito & Hession accepts all major credit cards.